Have you been checking out used car dealerships in Terre Haute for a great selection of used cars for sale? Then you need to go to the used car dealerships in Terre Haute of Terre Haute Auto. Terre Haute Auto has a large inventory of used cars for sale including a great selection of used SUVs for sale. Not only that, but the used car dealerships in Terre Haute, Indiana of Terre Haute Auto also have some of the best and most affordable prices around. View our online inventory of used cars for sale or visit us in person today at the used car dealerships in Terre Haute, Indiana of Terre Haute Auto. Are you searching for used car dealerships in Terre Haute, Indiana for used SUVs for sale near me in Terre Haute? Then come to Terre Haute Auto because we are the only used car dealership you need for used SUVs for sale near me in Terre Haute. We understand that finding a used SUV for sale in Terre Haute can seem like a never-ending process at other used car dealerships. You won’t find that at the Terre Haute, Indiana used car dealership of Terre Haute Auto. We have a team of friendly and knowledgeable people who are happy to answer any and all questions you may have about one of the many used SUVs for sale. Here at the used car dealerships in Terre Haute, Indiana of Terre Haute Auto, we want you to drive away with a smile on your face. We don’t want you to have a doubt in your mind that you are leaving in the right vehicle, so we take the time to get to know you first. We want to understand just what it is you are looking for when it comes to used SUVs for sale near me in Terre Haute, Indiana. Like a used Jeep Wrangler for sale in Terre Haute, Indiana. This used SUV for sale at Terre Haute Auto is both stylish and versatile. It is also economical with an MPG rating of 18 miles per gallon in the city and an impressive 20 miles per gallon on the highway. This used SUV comes equipped with a 2.5-liter engine with an automatic transmission and four-wheel drive. This used SUV for sale in Terre Haute features a convertible soft top for easy removal to enjoy the summer sun. This used SUV for sale in Terre Haute also features power steering for easy maneuvering the streets of Indiana. Some safety features that you will find on this used Jeep Wrangler are a drivers airbag, a passenger airbag, and an airbag on/off switch. 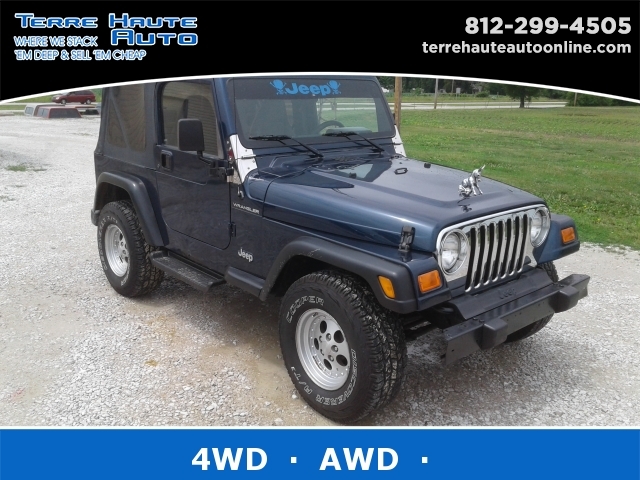 This used Jeep is ready to take on all of your driving needs here in Terre Haute, Indiana. Whether that be going to and from work every day, running errands around town or taking the day off and heading out for a weekend getaway, come and check this used SUV for sale in Terre Haute today and take it out for a test drive. If this used Jeep Wrangler for sale is not the used SUV for you, we have many more SUVs for sale near me in Terre Haute to choose from at Terre Haute Auto. Stop by to see what we have to offer you in our inventory of used SUVs for sale near me in Terre Haute, Indiana today. Whether you are looking for used SUVs for sale near me in Terre Haute like the Jeep Wrangler for sale or another make and model of used SUV for sale, we have the used SUVs for sale that you desire at Terre Haute Auto. Our experienced sales team members are here to answer any questions you may have and to help you find the used SUV that best fits your needs. If you are unsure of which type of used SUV works best for you, we are happy to find out all of your wants and needs in your next SUV and guide you in the right direction to finding the perfect one for you at Terre Haute Auto. Let us help you get one step closer to owning the used SUV you’ve been dreaming of owning at Terre Haute Auto in Terre Haute, Indiana today. Call today to schedule an appointment for a test drive at 812-299-4505. You can find Terre Haute Auto located conveniently at 13350 S US Hwy 41, Terre Haute, IN 47802.